The small beach city of Dana Point is one of the most popular destinations in Southern California. Famous for surfing and other water activities, Dana Point offers stunning ocean views from Headlands Bluff, one of the few harbors in Orange County. In the 1970s, Dana Point was known for its large surf, which got it the nickname “Killer Dana” from avid surfers. The development of the harbor in the same decade has somewhat tamed the waves and has made the beaches of Dana Point more accessible to everyone. The harbor has also become a favorite shopping and dining destination and is the site of a marina with 2,500 boat slips, a fishing pier, and other nautical features. 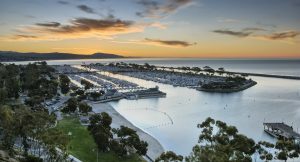 Dana Point was named after author Richard Henry Dana, Jr., who wrote about his experiences in the area in his book, Two Years Before the Mast, which was published in 1840. The city is ideally located between San Diego and Los Angeles, providing great access to four major airports. With the exciting beach life and great quality of life, it has to offer, Dana Point has become one of the most desirable places to live in Southern California. Dana Point has five distinct neighborhoods, featuring a variety of homes that highlight each area’s best attributes. Lantern Village is Dana Point’s historic downtown area. It was named after the colored lanterns that were used by boats which docked in the city’s natural harbor about 200 years ago to give notice about their fares. Homes in Lantern Village are a mix of single-families, townhomes, and condos, some of which are found in exclusive gated communities. Del Obispo is found along the San Juan Creek river and is the site of the Dana Point harbor and the Doheny State Beach/Park. The housing stock in this area includes single-family homes mostly built in the 1960s and 1980s. Found along wide welcoming streets, these homes were built in traditional, country styles on oversized lots, and come in a wide range of sizes and prices. Del Obispo is also home to several condos and townhomes, giving homebuyers a wide range of choices. Capistrano Beach features a notable bluff where you can find grand estates overlooking the ocean and the harbor. One of the oldest neighborhoods in Dana Point, Capistrano Beach features homes that were built from as early as the 1920s to the present. As a result, the housing stock in this neighborhood comes in widely varied styles and sizes and includes single-family homes, beach bungalows, townhomes, condos and others. Monarch Beach is found north of the city and is the site of some of Dana Point’s most luxurious gated communities where large estates and upscale condos can be found. The presence of the luxury resorts, Monarch Beach Resort and Ritz Carlton Monarch Beach, adds to this neighborhood’s prestige. Dana Hills is known as the most family-friendly neighborhood in Dana Point, featuring traditionally sized single-family homes built in the 1970s and 1980s. A number of condo properties can also be found here. The activity center of Dana Point, this beautiful harbor is kept busy all year round by residents and visitors who come here for its boating, shopping and dining opportunities. The harbor is home to several yacht clubs that offer weekend cruises, a commercial fishing operation that organizes whale watching trips for the public, and a number of restaurants offering a diverse range of cuisines. The shops along the harbor offer unique gifts and find, as well as luxury and popular brands. Dana Beach is home to 9 distinct beaches, offering myriad fun activities and attractions. Featuring stunning bluffs, campgrounds, picnic areas, parks, trails, sea caves and many more, these beaches are visited year-round by thousands of Southern California residents and guests. Among the popular activities in these beaches are surfing, boating, diving, fishing, whale watching and more.